Chester was my first and only Dachshund until I adopted Gretel. I knew a little about the breed but we basically lived in a vacuum. We didn’t know any other Dachshunds, or dogs for that matter, so I didn’t have anything to compare him too. Originally, he was my roommate’s dog. I just took care of him when she was out of town for work… which was often. I had wanted a dog desperately in college but didn’t think it was the responsible thing to do. I still wasn’t ready to commit after I graduated while I was still searching for my “career” job. Watching Chester was a good “trial dog” in the meantime. Chester ate what his real dog Mom bought for him and I tried my best to learn from her past experience with Dachshunds. He became my best travel and hiking buddy but he still belonged to her so she was in charge of making the big decisions. Five years later, Chester became mine. I started making the decisions about his care. I just went with what I knew at the time though. I was a pretty clueless dog Mom and I am pretty sure I made every mistake you could. I thought I was taking good care of him. Chester seemed pretty healthy and happy except he had itchy skin that got really, really itchy after a bath. Five years ago I adopted Gretel. She was a beautiful, timid little waif. She was super skinny. Too skinny. She also had mild allergies. Her reverse sneezing was so bad it was scary. She also had weepy eyes. Less than a week after I brought her home, I found myself sitting in the vet’s office for a checkup and looking at the body conditioning chart while I waited. It looked similar to this one. Gretel was definitely a #2. Since number 3 is ideal, she was going to need some nutritious food to help her fill out. Horrified, I realized Chester was closer to a 5! Not only was a new little whippersnapper in the house but it’s because of her he was going on a diet. Because of the weight and allergy issues, I started looking at what I was feeding them. I wouldn’t say the kibble they ate was the worst of the worst but it wasn’t very healthy either. The first ingredients were corn and grain. Grain and corn (rumor) are some of the biggest allergens. Corn has one of the higest glycempic index scores of dog food ingredients. The glycemic index is a way of measuring the tendency of a specific food to raise the blood sugar level of an animal. The higher the index, the greater the risk of an unhealthy rise in blood sugar. Keeping blood sugar balances is key to maintaining the proper weight and it helps keep diseases at bay. As far as the corn being an allergen, several studies show that corn itself may not be a common food allergen. However, it cannot be completely excused as a potential cause because of the notable difficulty in confirming the precise incidence of food allergies in dogs. While searching the Internet for these studies, I found a lot of legitimate reports by dog owners and veterinary sites reporting corn and other cereal grains as a likely cause of their dog’s allergies. In many cases, problems aren’t so much a matter of allergies to the corn itself but rather to undetected contaminants within that grain. In addition to the high likelihood that the corn was genetically modified and grown using pesticides, it’s not unusual to find storage mice, their droppings and expired carcasses in bulk lots of feed grains. All of these are known to be notable canine allergens. Check out this explanation by Dog Food Advisor for more info. So anyway, I wanted to find a quality dog food whose first ingredient was not corn or wheat and was high in protein. I wanted something with omega oils to help Chester’s itchy skin and a food with vegetables, fruits and vitamins. Although I new what I was looking for would be more expensive because it contained less filler and more good food, I also wanted something that wasn’t going to break the bank. I like to rotate Chester and Gretel’s protein sources so I like that is food comes in chicken, beef, duck, rabbit, and salmon. It even comes in a limited ingredient version which is made with one animal protein source in case you need to closely monitor the types of protein your dog eats (in case, say, they have a chicken allergy). In addition to switching to a better food, I reduced the amount of food I was giving Chester. It only took a few months but he got down to his ideal weight and is happier and healthier for it. His itchy skin all but disappeared and Gretel’s allergies improved. Switching to a grain-free was a simple, incremental switch to improve Chester and Gretel’s diet and health. I was already feeding kibble so doing this didn’t take any more effort. I did have to go through a process where I slowly transitioned to grain-free food though. I didn’t want the richer food to cause stomach upset. I started out feeding them a mix of 3/4 their normal kibble with 1/4 grain free for a couple of weeks. I then moved to half and half, 3/4 grain free with 1/4 regular kibble, and then to 100% grain free. The whole process took about a month and a half. I know I am fortunate that I can afford do pay more for better food for my dogs. In my case, they are small and I only have two mouths to feed. I know that several of you have multiple dogs and/or larger dogs so you may feel like it’s more expensive than you can afford. The thing is though, you can make a healthy change in their diet one tiny step, and a few pennies, at a time. Consider that you could transition to a 50-50 mix of regular kibble and grain free and feed that on an ongoing basis to save money while still making a nutritional improvement. If your dog needs to lose weight, you could switch to grain free but replace a portion of the recommend serving with frozen green beans (thawed – no canned because they contain sodium). You can also save money by replacing your expensive dog treats with the grain free kibble instead. So, in my first post of this series, when I told you that my dogs eat better than I do, I compared the quality of food I put in Chester and Gretel’s body to what I put in mine. It wasn’t pretty. At one point, I was eating 100% gluten free – similar to the grain free concept in dog food. I ate that way long enough to determine that it was in fact gluten that was causing my fatigue and headaches… then I fell off the wagon. I told myself I could cheat and eat a little gluten once or twice a week since that amount didn’t have a huge impact on me and it’s yummy. That once a week cheat has turned into almost a daily cheat though and I am back to where I started – feeling crappy a lot. This “no gluten” thing is something I think that the whole family should be on board with – myself as well as Chester and Gretel. My “little diet change” for myself is going to be going gluten-free again at least 5 days a week. Switching to grain free kibble wasn’t the end of the food journey for Chester and Gretel but it was a step in the right direction. I will be posting about the next step in our journey soon. 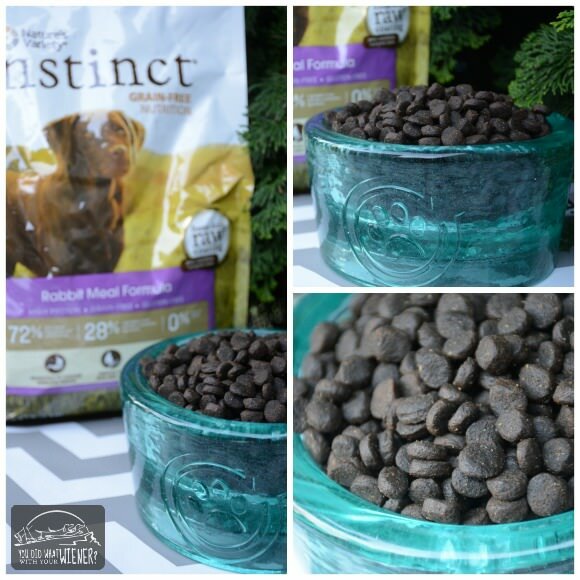 Have you thought about what incremental change you could make in your dog’s diet to improve it? I know you’ve talked about this before, but I love it! I just shared it on my facebook pages. 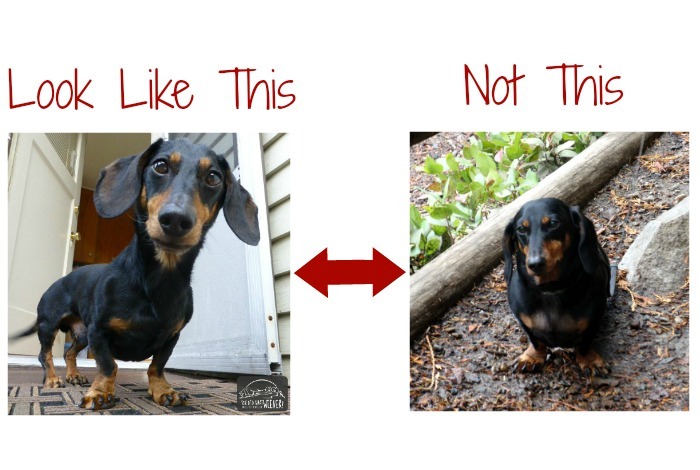 It’s so refreshing to see a fit doxie, far to often I see them super chubby. People don’t seem to realize small dog’s really don’t need much food, and a couple treats goes a long way when their tummies are so tiny. On the fitness scale subject, I’ve noticed some sport dogs in the #1-2 section. I’ve had a few people tell me Dante needs to be thinner, but I just hate it – it doesn’t make sense from an athletes point of view to starve them down to that size for a sport. Thanks for sharing my post. I guess I should have noted that some dogs are at a healthier weight naturally when they are a little closer to a #2. For example, my vet said that if a Dachshund is a healthy weight, you will just be able to make out the last two ribs when looking at them (smooth coated ones of course). 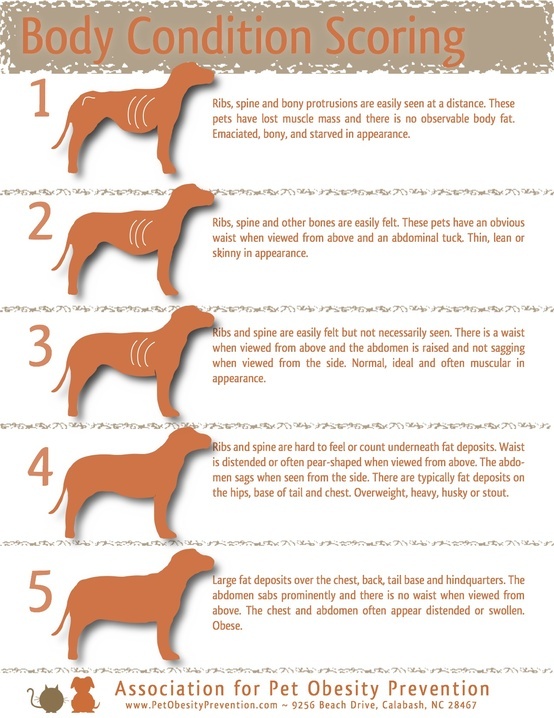 Greyhounds are also dogs that have ribs showing when they are at a healthy weight. I don’t think that it’s necessary to “starve” a dog down to a super small size unnecessarily though. I do get that being lighter in general makes things easier on joints and bones for athletes – both humans and dogs. Weight can be a complicated issue. Great post! Nola’s my first dachshunds, too, and I didn’t feed grain free until about…3-4 years ago. Huge difference! Nature’s Variety is a good food. I’ve fed it before, but Acana and Orijen works better for Nola. I switched to gluten free over the summer. I have almost no headaches anymore. It’s so interesting to see the differences! I love those also. When I fed Chester and Gretel grain free, I used to rotate between those and Nature’s Variety. I’ve been dealing with a migraine for two days now 🙁 I know it’s not the sole cause, and maybe not even the primary one, but I am sure it would help if I got ride of gluten and cut down on sugar. The big lightbulb for me was realizing that “best food available (in my budget)” and “works for my dog” are nnnnot necessarily the same thing. For most of her life, Lilo ate one of the objectively tip-top kibble a on the market and did well…right up until, for reasons unclear, she didn’t. Took me way longer than I’d now like to admit to switch her because I was so stuck on not knowing where to go from there. But what we’ve landed on (Nature’s Variety raw boost for breakfast, Fromm four-star in the evening) is not exactly terrible stuff! And she is soft and shiny and digestives stable again. Wish I’d been smarter sooner, but better now than never, anyway. I do wonder why I bother with the fancy grain-free diet when I take her to the barn and she promptly dives for the horse pop, though! That’s why I don’t judge what people feed their dogs… sometimes the “best” food doesn’t work for a dog. I consider Fromm, and obviously Nature’s Variety, to be good, high quality foods so that is good. 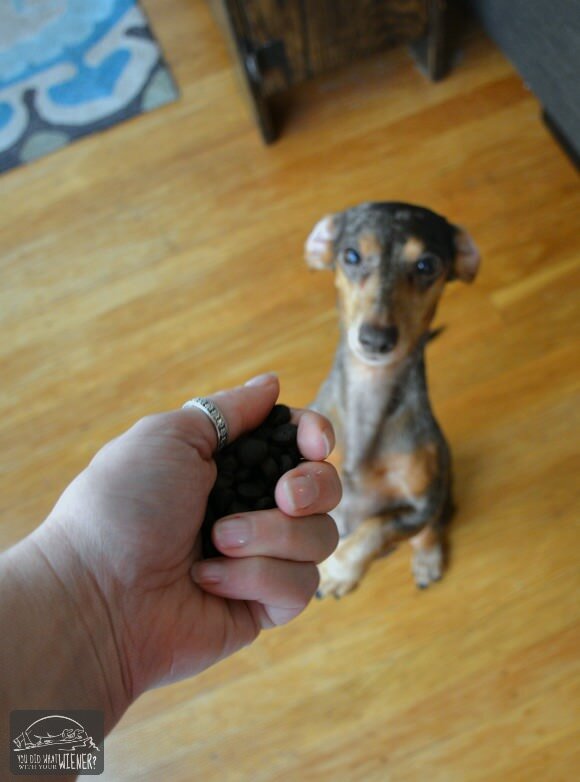 Blogging has made me a WAY better pet parent. That’s one of the biggest things I am thankful for. The Nature’s Variety Instinct Grain Free Kibble has a freeze dried raw coating so it is similar to “raw infused”. it sounds like you guys eat pretty good for sure. I really identified with this post! My first dog was a dachshund (purchased from a backyard breeder – I know, I know – but I was young and uneducated). I know I did every single thing wrong I possibly could as a pet parent from not training him properly to feeding him just horrible food. My third dog (a rescue – YAY) had tummy issues and we had to buy better food which was Pro Plan. Many years later, and the loss of two dogs to cancer, I am VERY cognizant of what I feed my dogs. I Feed various brands since I foster for a rescue and often feed donated food, but it is ALWAYS grain-free and the best quality my pocketbook will allow. I have phased commercial dog food from my dogs’ diet for the most part and now feed home-prepared and a raw diet that I purchase shipped frozen which I supplement with small amounts of good quality kibble for added nutrients. I can see the improvement in my dogs’ coats and their nails grow very fast and they seem to be very healthy. I can’t see the benefits on the inside, but I am hoping no more cancer and a lot better quality of life as they age. I’m with you – I don’t really see the benefits on the outside (although, who knows where they would be if I was still feeding the cheap junk food) but I believe they are healthier on the inside for it. I don’t see how that can NOT be true. It really does sound like our stories are similar. I can see why you can relate! Very much loved this article. I’m still new to the whole grain-free, gluten-free, raw dog food news. When we got our first dog we knew we didn’t want to feed them a junkie dog food so we went to a specialty food store that sold a variety of reputable brands. We were sold on Acana because it was locally made (canada) and had a lot of protein packed goodness for dogs. We had no trouble with our now 2 dogs eating it dry. Recently however, Acana has decided to change their entire line to grain free, which i found interesting, and i’m glad that it seems to be a better alternative. Hmm… I believe that Acana has always been grain free. Well, except for those few low-glycemic grain foods they came out with like the pork and apple. Do you have specifics on what has changed? I’m glad you found a food that works for you guys. What a huge difference the right dog food makes. Plus you’re active with your dogs too. Sydney is on a diet and for giggles I put Zoey on one too. They can both stand to lose some weight. They’re doing really well and the weight is dropping off. Not many grains in their diet; mostly veggies and raw. I definitely think that BOTH are important components to good doggy health – good diet and exercise – just like with people. I am not as active with Chester and Gretel as I would like to be. I kind of fell into a rut when my Grandma died and then I started grad school. Chester and Gretel already eat good but I plan to add some more supplements to their diet this year and step up the consistency of our physical activity. I feel like a horrible mom. Wynston is overweight. I know it’s my fault and I know it’s not good. BUT I realize it and I’m working on it. Yesterday I realized that when Wyn was my only dog, we’d play all day. Whenever he wanted to play, it’s be a 15 minute game of fetch. And we did this from morning until night. Well now Khloee and McKenzie Rae later, it’s not like that anymore. We get some play time in (and I try to take time to just play with him) but he’s not getting the indoor exercise like he was before. I’m starting to take him on longer walks and be more attentive to the fact that we need to play more during the day. He gets quite a work out running back and forth in our house as long as the girls aren’t getting in the way. I’m glad you found a food that works well. That’s definitely a big first step. Yeah, that reduction in activity makes a huge difference for a little dog. The good news is, it doesn’t take hours of exercise to make a positive impact on a small dog either. It’s good that you realized now and are doing something about it. I see some dogs that are severely overweight and their owners don’t know or don’t care. It’s sad. I signed up for Darwin’s at an event and got shipments for a while. It is a good food but we also found that the supply outpaced our demands. Each month, we got more and more behind until I had two months worth stored up. I postponed our next delivery but I think I am actually going to discontinue the service. I like to rotate Chester and Gretel’s raw food. Our favorites are Instinct frozen raw, Primal, Vital Essentials, and Tucker’s. I’m not a stickler about raw though. sometimes I feed them a high-quality kibble as a “treat” meal. It also works good for training treats. Rubys first foray into raw was the Darwins food, and I think it is really a great product. Ruby prefers her raw food to be frozen when she gets it, not so keen on thawed. I wonder why??? I’m not sure either. Chester and Gretel don’t mind it either way. Thanks for this excellent post, Jessica. Both Bocci and our kitty, Bella, have always eaten grain free—but then again, I’m a longtime “foodie”, myself, and always have splurged on high quality food for both me and my furkids. Struggling with food is such a pain. I’m glad you figured out what’s bothering you. I’m not lactose intolerant (that I know of) but I still try to eat dairy only in moderation. Mine is a chihuahua so I have the feeling that he will either be obese or too skinny. I mean, you are bound to feel the ribs on a Chihuahua, don’t you? You should be able to easily feel the ribs under the skin on any dog. It will be easier on some dogs at a proper weight (Dachshunds, Chihuahuas) and harder on some others (pug) but if you have to press too deep to feel them they are probably overweight. Thanks for this great article. I agree with you that corn and grain are the allergen for dog food. Food company use this as filler ingredients. We should always choose a food which is grain and corn free. Thanks again for your explanations.